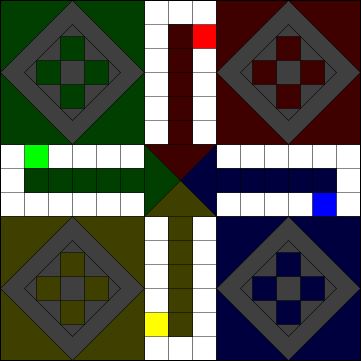 For more information, see the Wikipedia article on the game of Ludo. Ludo is a multi-player board game which originated in India. Nowadays it is played throughout the world and is known by different names. Therefore, different variants exist. It is played by two to four players. In team-play mode, the players who sit diagonally opposite from each other form teams. As per the board, it is usually red-yellow vs. blue-green. The objective of the game is to get all of your coins into the home pocket before your opponent(s). This is what the board looks like. As you can see, it has a symmetrical structure with four colors (green, red, blue and yellow) and a white background. The players of the game take up one color each for their coins and starting positions. We can identify four parts on the board, which are described in the following sub-sections. The pockets are the big squares on each corner of the board. This is where the game begins. As suggested above, there are four pockets, each one corresponding to each player. They are identified by the colors green, red, blue and yellow. A pocket can only hold coins of its own color. The home pocket is the slightly larger square with three triangles inside of it in the middle of the board. It is the final destination of all the coins in the game. Once a coin reaches the home pocket, it is placed on the triangle of its color and it cannot be moved or consume any dice throws. The track consists of the 52 squares around the home pocket. 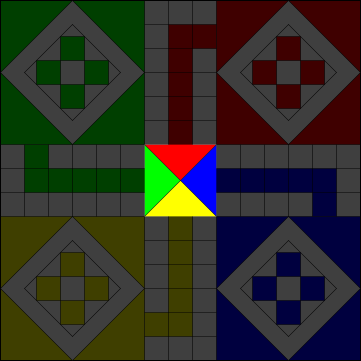 Note that 48 of those squares are white and only four are of a different color. The coins go through the track in a clockwise fashion, starting at the non-white square and must traverse the track completely. Once they reach the tip (or mouth) of the home run, they leave the track and enter the home run. The home run consists of four sets of five squares, bound by the track and the home pocket. Each set is assigned the same color as the pocket it is connected to. Only the coins of the same color are allowed on the home run and therefore they are unassailable on their respective home runs. Coins enter the home run at the end of their run along the track, i.e. after they have traversed 51 squares. Note that they never reach the 52nd square in the track, they must enter the home run after the 51st. 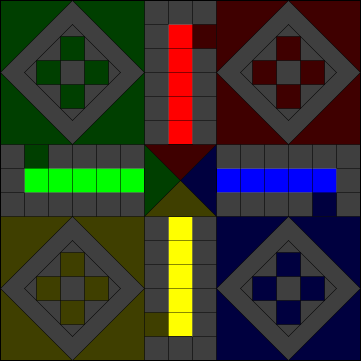 The coins in the game are four of each color, and they start off at their respective colored pockets. After leaving the pocket, they traverse the whole track to finally enter the home run. Once they reach the home pocket, they cannot be moved. The default image of the coin is a circle. The following are the rules of traditional Ludo. It is important to note that different variants of the game exist. The game is played by two to four players. Each player is assigned a color. The players start off with their four coins in their pocket. The objective of the game is to get all your coins into the home pocket before your opponent(s). You can choose to pass on a score if you don't want to use it. Once you roll a six in a dice throw, you have to roll the dice again, and must use all scores while making the final selection of what coins to move where. If you roll a six three times in a row, your throws are reset and you have to roll the dice again. You have to apply a score from roll of a dice to a coin wholly, not by part. For example, if you have rolled a six and a three, you cannot move one coin by five places in the track, and another by four places. You have to move one coin by six places, and (either the same one or a different coin) by three places. In team play, your dice roll score can be applied to your teammate's coins as well. In order for a player to be able to release a coin into the track from its corresponding pocket, the player must get a six from the roll of the die (in which case the player must choose whether to use the score to take a coin out of the pocket or to advance a coin that had been previously released). 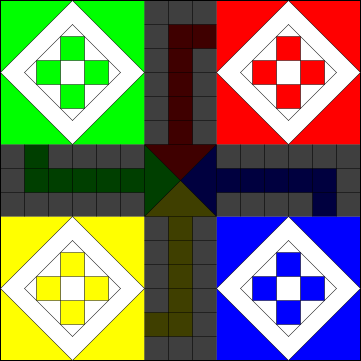 Coins are released on the colored square of the track. The player gets an option whether to form a pile or not. The piles can form or disband only at the four starting positions of the track. A red pair, for example, can form or disband at any of the four starting positions of the track. Piles can be formed using coins of the same color or using coins of the team-mate's color, if the two happen to land on the same spot. A pile moves by dividing the dice throw by the number of coins in the pile. For example, in a pile of three coins, it moves by one spot if the player rolls a three; it moves by two spots if the player rolls a six, etc. The pile can move as a unit only if the dice throw represents a multiple of the number of coins on a pile. Meaning, if you have two coins piled up in one square on the track and you have rolled a five, you cannot apply that to the pile and move it by two or three squares. If you do not have any other legal move, you must forego your score and the next player's turn comes up. A single coin can only be dismissed by another single coin, not a pile entering the same square. A pile of coins can only be returned by another pile of the same size, neither bigger nor smaller. The piles can be disbanded at will inside the home run, even if there are restrictions on formation/ disbanding on the main track. A coin stays in the home run only if it advances exactly to the home pocket, else it bounces back. For example, if a coin is three squares away from the home run and the player gets a five on the die, the player might advance three positions to the home pocket and then move back two positions from it to add up five. The coin can advance in the home run only if it reaches exactly inside the home pocket, or moves closer to it through the home run. For example, if the coin is four squares away from the home pocket and the player rolls a five, he must apply the throw to some other coin. However, if he rolls a two, he can advance his coin by two squares and then it rests there until the next move.